Senior Pastor for Global Impact Gospel Church (GIGC); Rev. Eric Akosah has stressed the need for adequate communication within families. He says a lot of problems in marriages and families will not exist if there was adequate communication. Rev. Akosah was the guest speaker during the 2018 annual review meeting of Women’s Health to Wealth; an international non-profit organization that champions the health, education and economic empowerment of women in the Ashanti region. Rev. 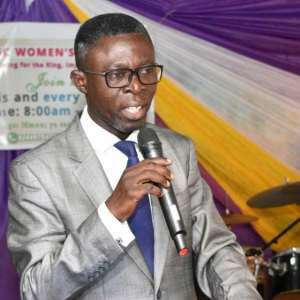 Akosah, who is also a health and social worker, urged the women to apply biblical principles of submission as the bible urges women to submit to their husbands. He urged men to love their wives and children to obey their parents. “Communication problems constitute a huge problem that breaks down many family units but the family works well when there is proper communication,” he said and added that a family that communicates produces offspring that are useful to society. He encouraged women to pamper their husbands and make them feel good and explained that it is only when the man feels loved and pampered will the woman also assume her rightful place of authority in the house. He advised women to communicate more during pregnancy or times of the month where they cannot perform certain functions and discouraged making assumptions that the other spouse or the rest of family should know her situation. He says women should not assume their situation is obvious but should communicate how they feel adequately and in very nice ways. The women took turns to share their experiences on the subject as well as how their relationship with WHW has benefited them and their families. They promised to do more in 2019 in order to reach out to more women and also speed up their own empowerment efforts. Executive Director for WHW; Nana Abena Akuamoah Boateng who spoke to Bernard Buachi explained that her organization is helping the women remove middlemen from their businesses to enable them make maximum gains. She also explained how her organization is teaching the women basic entrepreneurial skills and inculcating within the women the culture of saving money.